After meeting artist Shigeyuki Kihara at the reception for Paradise Lost? I was excited to have the chance to hear her speak about her work. As a part of the International Symposium of the Pacific Arts Association, Kihara, along with other artists in the exhibition, gave a presentation on her video work which is currently being shown at Satellite Gallery. Taualuga: the Last Dance (2006), Siva in Motion (2012) and Galu Afi: Waves of Fire (2012) all address Samoan cultural heritage, history of colonisation, and the need for re-examining history. 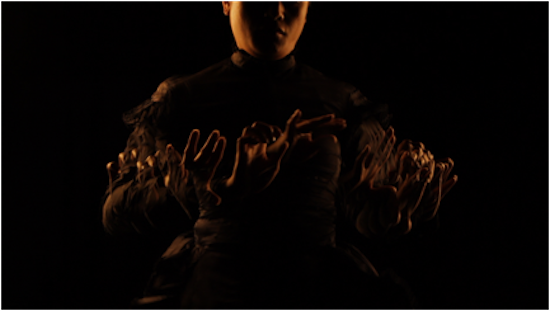 The videos feature Kihara’s alter ego, Salome, who dances the traditional dance of taualuga, a Samoan storytelling vehicle. During her presentation, Kihara explained her alter ego as well as her views on history, providing new and insightful ways of understanding her practice. During her talk, Kihara described the creation of her alter ego, “Salome” who repeatedly appears in her work. Salome was born after the artist came across a photograph of a Samoan woman in a black Victorian dress who was looking back at the viewer with a firm, confident gaze. It defied the usual images of “dusky maidens” that recurred in photographs by Thomas Andrew and his contemporaries. The Samoan woman in this photograph was neither sensuous nor vulnerable. Her expression was assured and confident. Fascinated, Kihara delved into the image, and the significance of this anonymous woman continued to grow. The photograph embodied resistance in Samoa’s colonial past and emancipated present. Salome’s name comes from Oscar Wilde’s play with the same name which is based on a biblical story. Salome, stepdaughter of King Herod, asks for the head of John the Baptist in exchange for her seven veils dance. Like Salome, who uses dance as a tool for political manipulation, Kihara’s Salome attempts to create an input into the complex history of Samoa. Similar to the “dusky madens” of the Pacific, Wilde pictures Salome as a total sexual spectacle, entangled in metaphors of looking and veiling. Kihara wants to remove the veil of paradise in which the Pacific has been tangled for years, from colonial photographers to today’s tourism industry. She does so by rewriting history in her work. Through the traditional dance of taualuga, she mourns and commemorates the tsunami of 2009. 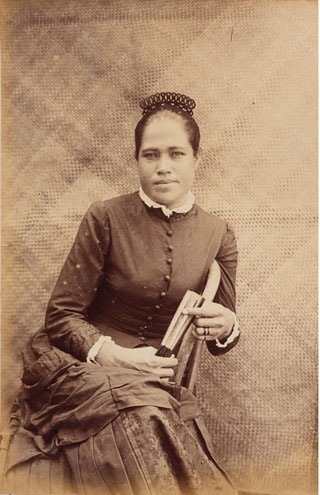 Her method of recording history belongs to the Samoan oral tradition. Salome’s dress contradicts her actions; she dances bound by a black Victorian mourning gown, a garment notorious for its restriction of movement. Salome continues the tradition of her people while acknowledging (and accusing) the colonial rule. 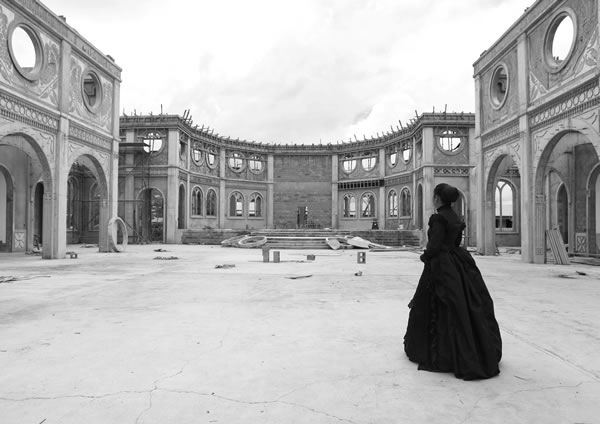 Her body is wrapped in the dark dress which is engulfed by the darkness of the video where Salome seems to float alone. The solitude amplifies the sense of mourning over the destruction of the tsunami as well as another destructive wave — colonisation. At the symposium she also introduced another body of work, Where do we come from? Who are we? Where are we going? (2012), a photographic series that pictures Salome in sites that are imbued with cultural, historical, political significance. These images, even to a viewer who may not be familiar with Samoan heritage, are evocative enough to generate a sense of understanding. In Roman Catholic Church, Apia, we can see the ruins of a European church where Salome stands with her backs to us. Salome’s solitary presence and the medium of the black and white photograph create a somber mood. It is an homage, mourning and remembrance. Through these photos she hopes to ask these existential questions: Where do we come from? Who are we? Where are we going? They remind us that a person’s life cannot be separated from her understanding of history. Kihara’s practice continues to re-envision history’s hold on her and her people. Paradise Lost? is on view at Satellite Gallery (until August 31) and the UBC Museum of Anthropology (until September 29, 2013). This entry was posted in MOA, Talk and tagged Museum of Anthropology, Pacific Art, Pacific Arts Association, Salome, Samoan Art, Shigeyuki Kihara, Taualuga. Bookmark the permalink.